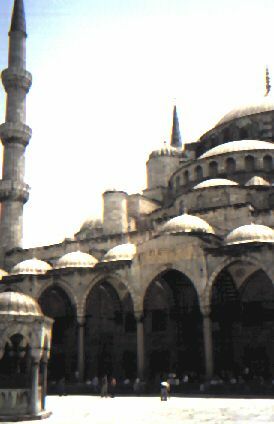 (Chris) We didn't get moving too quick or early but were sitting outside the Blue Mosque eating bread and honey by 11am. Then we entered this awesome piece of Renascence architecture to see what it contained. Carrying our shoes in a bag like all the other tourists within, we took a deep breath of what, for some of us, was our 1st mosque. We inhaled Au'd' Sox. Yes, it smelled vaguely of the glory of Jim McCoy's quad room but Sam equated smelly socks to Fritos. Aside from the smell, it was quite pleasant within. There were tons of nice blue designed tiles on the walls - they remind me of an American bathroom. The rugs everywhere were comfy and colorful (though factory made). The domes were nice and nice and nice and nice and nice (I think there were five.) There was no real artwork, though, that I remember. Just a big, colorful room, really. 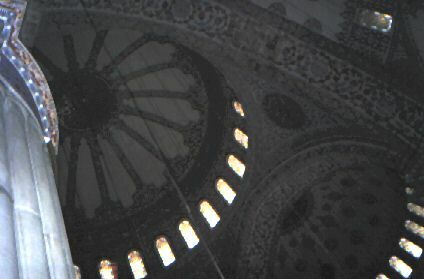 Like Hagia Sofia and so many other great sites of Western Turkey, it was built under Emperor Justinian (6th century.) 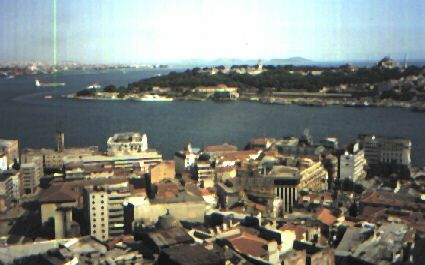 It was the main water reserve for Constantinople. 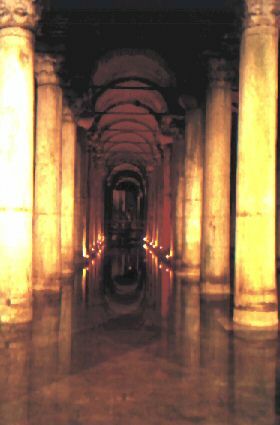 It was only about 30 feet underground but it was huge and had dozens of pillars of Corinthian Style, jutting up from the water. The Turkish Government put alot into keeping the place presentable. The colored lights and classical music made it all more surreal. 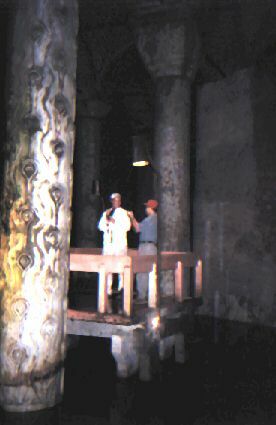 There were wooden walkways so you could have access to the most distant (and decorated) pillars. There were large fish in the water, which seems to be kept at a level of only 2 or 3 feet deep (though the ceiling was probably 30 feet high.) In the back corners, at the base of 2 pillars, were giant heads of Medusa in marble. One was sideways and one upsidedown. These older pieces of pagan art were imported by the Christian Justinian for unknown reasons. We are also clueless as to why there is so much beauty put into what is essentially a water tank. Who in that time, ever observed it? We left satisfied but with such lingering questions. From the cool respite of the cistern, we ventured back into the blistering heat and marched to the (for lack of a better word) riverfront. The Tumbleweeds were soon wheeling and dealing with the local skippers. We settled on a 2 hour $6 boat tour of this famous confluence. I sat with some locals on the lower level while the others took in more sun on the upper deck. Aside from the loud engine, it was a quiet trip. We saw many mosques, floating garbage, and a huge government palace on the water. 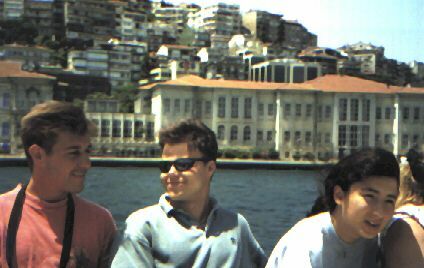 Dave kept throwing around terms like "Golden Coast," and "Ismus" and "Peloponese," and "Maramis," and "Bosphorus," but I think we were all still a bit out of it geographically. So we stopped to eat and had some delicious lamb concoctions for cheap and nice ice cream cones. The trip back to the dock was uneventful. The boat ride wasn't real impressive but was a nice thinking time. We crossed one of the bridges in town. Men were fishing on it, but were catching only little fish despite the length of their mighty rods. We saw the nice Catholic cathedral and then took an elevator to the top of the Galata Tower (the local soccer team is Turkey's champ and called Galata.) The view was awesome from the tower and we saw many things and spit upon others. We hit the Egyptian bazaar (as if we hadn't yet had enough of Egyptians selling us stuff) on the way back to the Peynsion. I bought some overpriced, overrated Turkish delight, which we never finished eating. Matt bought sunglasses. Sam and I got separated from the others as we looked at Galata jerseys. We headed back to our place and stopped in the gardens between Blue Mosque and Hagia. The fountain was huge and running (it's only turned on occasionally) so we admired it. We were propositioned by a carpet man. We told him we were almost sure we'd not buy one, but he insisted on having us over for tea and talk. His name was Ibrahim and he served nice apple tea in a wonderfully A/C room with nice couches. He told us about Turkish rugs and the 5 types of them. The ones I was most interested in were a combination of silk and wool from the far east of Turkey (Mt. Ararat region.) In honor of Noah's Ark, they had tons of animals on them. The lowest he'd go on a 3' by 5' was $300. I might have bought one but didn't feel like carrying it another week. We met the other guys back at the Star Pension. As we ate a few delights and sipped Fanta, we considered hitting a bar for our last night in Constantine's capital. (Matt) I had gone the night before to blow off some steam at the bar by watching belly dancing, drinking, smoking, and dancing like a maniac. So I took the guys over to the bar (which had been packed the evening before,) but it was totally dead. Actually, we were the only people there. So we sat, drank very large beers, a couple of us smoke cigarettes I bummed from the bartender, and sang along to the songs on the radio. It was a fine evening over all. We hung around till they played, "Rasputin, Rasputin, lover of the Russian queen," then we went to bed.